We will see many aspects of Balinese life, start by attending a performance of the barong and kris dance at batubulan village, which story the perpetual struggle between good and evil, and than also visit tegenungan waterfall, where the waterfall has biggest jet water with 25m highest , and than next we will go up side of kintamani where you will see will see the spectacular view of the active volcano and batur lake with the high is 1717 meters above sea level, in here also there are many restaurant for having lunch and while enjoy the beauty of valley and caldera of Batur volcano. After we finish at Kintamani, we will visited a coffee plantation will reach around 25 minutes from Kintamani, in the plantation your will see many kind of herbal tree and spice, any kind of fruit tree and of course you will see coffee and cacao tree, and also you will know, how the people process roasting the coffee by manually from the bean to be powder. In this journey it feels incomplete if we didn’t visit a temple, the temple we will visit is Holly spring water temple, and Balinese peoples call Tirta Empul temple, where the temple is very quiet, and has beautiful architecture and also has natural spring water coming from under ground and most Balinese used this temple for purification sanctification, and Tirta Empul Temple is built around the sacred spring at Tampak Siring. For more than a thousand years, Balinese worshipers have been drawn to Tirta Empul Temple whose sacred spring is said to have been created by Indra and to have curative properties. The tradition continues almost unchanged at the temple today.Over 1000 years old, the temple and its two bathing places have been used by the people for good health and prosperity because of the spring water's curative powers. And the last journey will see the panoramic of rice terrace in Tegalalang, where we can see the rice paddy field like a terrace and see the peoples how to process grow a rice and more educative with the water irrigation system in Bali. We will see many aspect of Balinese life, start by attending performance of barong and kris dance at batubulan village with the story between good and evil, after that we will go to ubud village ,there you will see ubud palace kingdom, with the Balinese stone carving style , outside of ubud palace you will see ubud market,, there you will see many peoples sale the thing , like traditional souvenir, here also you may take a lunch on any restaurant you want,. And than we go to taman ayun temple,, which the temple dedicate to royal family on the mengwi village, surrounded by an artificial moat. And the last place we will visit tanah lot temple,, where the place of temple on the top of the rock and also on this area you will see the sunset. After we pick up in the hotel around 8:30am. We will go to a place , where the place has traditional market, where you will the peoples who sell the crop from their garden, field, and plantation with fresh ingredient , And then we will go to a place of Tembuku village, where we will see the TUKAD CEPUNG waterfall, which this waterfall is unique, because it is between the crush of river wall that resembles a cave and still have natural nature, and the atmosphere will be very amazing, because there will be sunlight that enters through a small gap that is above the waterfall and it makes like a silhouette. After that we will visit traditional village of PENGLIPURAN, where in this village we will traditional house whit same entrance gate and also we can go in the house of local peoples, to see, how look like inside of the compound in the village. After we finish in this village, the journey will be continue to the mind stop of the trip is KINTAMANI. KINTAMANI village is located in the top area of island is at 1000m above sea level, where it has cool air and has malignant inflammation with its still active volcano and beautiful lake Batur located within a large caldera, where many peoples will enjoyable the view while do lunch in the restaurant there are a cross of batur volcano. And than the last destination is TEGALALANG village TEGALALANG village is village famous with rice terrace, in this area you will see the famers, how to proses plant the rice and technique of water irrigation system in the rice paddy field, and also you may enjoy the nice view of the green side of rice terrace. After picking up from the hotel at 09:00am, we will go to NUNGNUNGAN village, to see the waterfall of NUNG NUNG, This waterfall very excited because the natural is nature and no commercial place, then we will go to BEDUGUL area a mountain village located more than a 1000m above sea level. We will stop at ULUN DANU BERATAN LAKE TEMPLE, where we let ourselves be deceived by the sensible optical illusion that the temple of the fleet above the LAKE BERATAN. 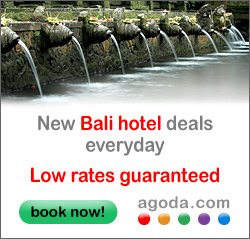 This sanctuary is dedicated to dewi danu, is a the gods of water, and is one of the most iconic image of BALI. And then we will stop at JATI LUWIH village, in this area we may to see the traditional rice terrace arrange by the local, regarded as World Heritage Sites, as evidence of Balinese determination and careful to attention to local plants. And our the last stop is TANAH LOT TEMPLE TANAH LOT TEMPLE IS a beautiful Hindu sea temple and located on an island 100 meters off BALI southwest coast, this is an amazing place to see a sunset from the side. After picking you up at the hotel around 8:30am, we will start the journey where we will enter the most traditional side of BALI, that is to visit the GIANYAR TRADITIONAL MORNING MARKET. Treasures Hidden island with a lively atmosphere where, in addition to shopping, you can get a taste of the local farmers life, where they sell the products from fields and gardens produced by local farmers. And then we visit the BALINESE culture in the traditional village of PENGLIPURAN. Where we see tradition, local customs and feel the atmosphere of life in the countryside and visit the vast bamboo forest of the village and use them in the daily life of local peoples for making some offering, home and so on. After that we will visit the biggest temple in the island is THE MOTHER TEMPLE OF BESAKIH. BESAKIH temple is the most important pilgrimage center in BALI, located in the slopes of AGUNG volcano which still active and purified by Hindu peoples and consist of 22 Hindu temples and of course has a view from the highest point is very impressive and spectacular. And our will be continue to the journey until we reach RENDANG, is a small town where we will enjoy the beautiful scenery, where you can attach lunch to one of the places favorite by local, the real indigenous BALINESE food. Our last stop is CEPUNG waterfall, A waterfall that has a uniqueness, where this waterfall is in between the wall resembling a cave and still has natural nature. Bali East tour will beginning from Goa Lawah Temple, this temple is a Balinese Hindu cave temple where thousands of bat have a nest inside of the cave and used by Balinese Hindu as a place to worship to the god. And the journey will be continue to Tirta Gangga water palace Tirta Gangga is a beautiful garden with water fountain and fish pond surrounding and has nice natural atmosphere with the local. And then we will visit the Lempuyang Temple. No one know , when this temple is built, but this temple already exist in the era of Siwa Buddha, know as the oldest temple in Bali and considered as one of 9th main temples on the island. It is located on Mount Lempuyang on the East of Bali, Lempuyang Temple is really famous for it gate as THE GATE TO THE HEAVEN, because it look exactly touch the sky. From this temple you can also able to see the AGUNG VOLCANO very clearly. And the last destination of our journey to be continue to visit Taman Ujung, is located of ujung village on Karangasem District . Taman Ujung is beautiful garden with fish pond surrounding the old building that is one of Karangasem Empire”s omission, this garden is generally used by all kings for resting, because this place is fully designed with artistic value so that the king his family can found their relaxation. Our journey begins with visiting the waterfall Tegenungan , with beautiful panorama, which is located in an area Gianyar regency, with scenery is still beautiful and natural , this waterfall is very unique , because it is located in low lying area and very easy to reach from kuta, sanur ,nusa dua, and ubud. Than continue to travel in the elephan cave temple, this temple is a center that is not subjek bedahulu kingdom of java or Majapahit Kingdom influence at the time. And there we will see temple have elephant cave reliefs and the shower for the king and relics of the client statue. And the journey will see the panoramic of rice terrace in Tegalalang, where we can see the rice paddy field like a terrace and see the peoples how to process grow a rice and more educative with the water irrigation system in Bali. And then will continue toTanah lot temple is located in the southwestern part of the Bali island, more precisely of Beraban village, or in the Tabanan regency. Tanah lot temple built on the top of rock in the located in the middle of ocean, and the temple is made in the 16 century by master of java with the name dhang hyang niratha and referred to as the public interpreted as a savior of Hindu religion in Bali. And in this location there is also another one temple it”s very unique , because the temple is located on top of a steep cliff and at the bottom of the cliff there is a big hole in the pass by large waves of ocean, not only that , but here tourists also can enjoy the sunset scenery is very beautiful and spoil the eyes of visitor. The first we will visit the Ubud Monkey Forest in heart of Ubud, where there are around 700 monkeys stay in the forest, and so close with human and as security of the secret forest in Ubud. After that our trip will be to continue to caldera of Batur volcano, where there are a place has a natural hot spring, and you can enjoy the hot spring in the swimming pool exactly side of the Batur lake with a spectacular view from the side and also you may see the Abang mountain too. After we finish from hot spring, we will going up to the side of Batur volcano enjoy lunch buffet with nice side to see to view of caldera, lake and Batur Volcano. In this journey it feels incomplete if we didn’t visit a temple, the temple we will visit is Holly spring water temple, and Balinese peoples call Tirta Empul temple, where the temple is very quiet, and has beautiful architecture and also has natural spring water coming from under ground and most Balinese used this temple for purification sanctification, and Tirta Empul Temple is built around the sacred spring at Tampak Siring. For more than a thousand years, Balinese worshipers have been drawn to Tirta Empul Temple whose sacred spring is said to have been created by Indra and to have curative properties. The tradition continues almost unchanged at the temple today. Over 1000 years old, the temple and its two bathing places have been used by the people for good health and prosperity because of the spring water's curative powers. And the last journey will see the panoramic of rice terrace in Tegalalang, where we can see the rice paddy field like a terrace and see the peoples how to process grow a rice and more educative with the water irrigation system in Bali. Inviting you to enjoy the adventure rafting at Ayung river which is still wild with the beautiful and high river bank. Ripples wave to the river rock, trekking Bali natural pass the river and the adventure will finish by two hours whit 12km longest of the river, in the end of rafting, you will serve by local food and serve by buffet with nice view from the places, after that you will continue the trip by visit the rice terrace of Tegalalang, where the place have very nice green side of view with the terrace of the paddy field and after that you will invite to visit the temple in the north side of Ubud, where the temple of Gunung kawi sebatu is temple dedication for wisnu god on recommend of Rsi Markandya, he is a secret teacher from majapahit kingdom, which has influence in the archipelago to the kingdom Bali too. And Gunung kawi sebatu temple is built after 1300 century. The meaning of the name Gunung Kawi Sebatu temple comes from the word “Mountain and Kawi, which means “made” and “sebatu” which refers to the name of the village where this temple was built. The challenge will be start early in the morning and will invite you to do the adventure trip, and will beginning of climb to Batur volcano to see the sunrise from behind of mount abang, will be present a spectacular of view in between sunrise, mountain, lake, and caldera in a view hours after that you will inviting to the swimming pool has hot water. Where the hot water production from the volcano of batur while enjoy the view of Batur lake and get some refresh of the body after the hiking, and on the to Tegalalang rice terrace there are some coffee plantation, will serve you many kind of coffee product and many kind of tea to drink, after that will visit of the beautiful of rice terrace Tegalalang, where the field have green side of view of rice field. And your journey of adventure will be 100% completely in one day. 02:00am Ubud, sanur, kuta,seminyak,nusa dua. We will go directly to the sacred Uluwatu temple,, but we will pick-up you divine of you hotel location, this temple built on the rock 300 feet high overlooking to the Indian ocean in the far south of Bali island, the view of the cliff by the sea in the Indian ocean on o good day with the sunset breathtaking. In the same place just before the sunset ,Kecak dance will represented with the theme of Ramayana story, accompanied by a chair of more than 50 men , who dance well with a movement similar to the monkeys, after seeing the dance they accompany the Jimbaran beach to finish with a seafood romantic dinner. The first we stop at Ubud monkey forest, where this forest is very secret by the people of Ubud, which in the forest stand two temples ( village temple and Beji temple ) and also a cemetery designated for the local community of Ubud and inhabited by around 700 monkeys. And the trip will continue to Mengwi village to see Taman Ayun temple, surrounded by on artificial moat. After that we will go directly to Tanah lot temple, where the temple the place on the top of the rock, Tanah lot is exciting tour package to visit place of interest in west part of the Bali Island and this tour will bring you witness the breathtaking view of the sunset goes down to the earth.